This pack of 50 EVACU-AID triage tags will provide first responders with the ability to perform immediate triage evaluations and clearly mark victims for medical treatment when more help arrives. 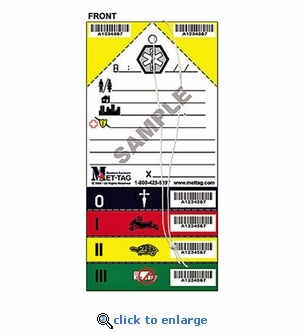 These industry standard triage tags are designed to be completed and read using recognizable symbols and graphics to eliminate language barriers and common misunderstanding. MT-137 Triage Tags are used by first responders including EMS, fire, police, military units and federal, state and local emergency management and response organizations. The MT-137 Triage Tag has proven itself vital in saving lives in real disaster situations for decades. Material: Moisture and water-resistant synthetic. Sequential Serial Number & Barcode: Aids in tracking victims. Elastic Band: 30" band for attaching tags to victims.